Bombay High Court on Wednesday held that if marriage is contracted with second lady in subsistence of first marriage, then the second lady cannot claim to be a widow entitled to pension after the death of the man. A Division Bench of the High Court on Wednesday directed the Maharashtra Government to file a “detailed reply” on a bunch of PILs alleging that marriage bureaus in the country were functioning unregulated, with some of them openly facilitating the menace of dowry. The Delhi High Court Single Bench Justice Manmohan dismissed the suspended BharatiyaJanata Party MP Kirti Azad’s plea seeking a court-monitored CBI probe into the alleged high level of corruption in Delhi District Cricket Association (DDCA) or constitution of a Special Investigation Team to investigate into the mismanagement by the officials of DDCA. The Court on Wednesday, quashed the lower’s Court’s order, which had directed the Central Bureau of Investigation to release the documents seized by it during the raids at the office of Chief Minister Arvind Kejriwal’s Principal Secretary Rajendra Kumar on December 15. The search was carried after a search warrant was issued by the lower Court. A Division Bench of the High Court on Monday held that Parliament cannot change the terms of a treaty, by bringing in amendments in the domestic law. A Division Bench of the High Court on Friday sought the TRAI’s response on Bharti Airtel’s petition challenging the Telecommunication Interconnect Usage Charges (Eleventh Amendment) Regulations, 2015. The Bench, comprising Chief Justice G. Rohini and Justice Jayant Nath has sought TRAI’s response by March 1. The Jammu & Kashmir High Court on Tuesday asked both the Central Government and the Reserve Bank of India to consider incorporation of Dogri language on the language panel of currency notes and Indian postal orders, if possible. The High Court ordered Central Bureau of Investigation(CBI) to take over the further investigation of a murder case of a youth aged 21 years in Kannur District, Kerala, from the State Police. The Court has ruled that an actor cannot be prosecuted for not displaying the statutory warning “CONSUMPTION OF ALCOHOL IS INJURIOUS TO HEALTH” in a particular scene in a film in which he acted in the lead role. The High Court ruled in P. Sujanapal v State of Kerala & others [W.A No:1524 of 2014] ruled that except in exceptional circumstances, a judicial officer is protected from legal action of whatever nature for wrong orders rendered by him. A Division Bench of Madras High Court on Tuesday directed the Union Home Ministry to deliberate upon conferment of Bharat Ratna on NetajiSubhash Chandra Bose. It has directed the Centre to pass an order within 8 weeks. The Madurai Bench of the High Court directed Dindigul Collector and Municipality to accept a transgender’s application for a job as a noon meal organizer, a position which is reserved for women candidates. 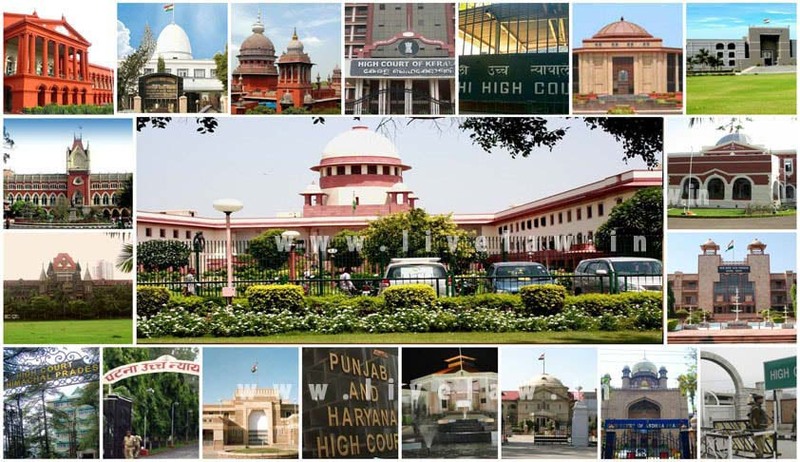 In a recent judgment, Punjab and Haryana High Court has held that a woman doctor can’t be debarred from joining the Army Medical Corps (AMC) just because she became pregnant during the course of the selection process. “By forcing a choice between bearing a child and employment, it interferes both, with her reproductive rights and her right to employment. Such an action can have no place in modern India,” Justice Harinder Singh Sidhu observed. A Division Bench of Rajasthan High Court on Monday issued notice to the Registrar General of the High Court, on a petition challenging the Court’s RTI Rules. The petition, filed by a law student, Dharma Raj, challenges the Rajasthan Right to Information (High Court and Subordinate Courts) Rules, 2006, as being ultra vires the Right to Information Act, 2005. The Rules were formulated by the then Chief Justice of the Rajasthan High Court, drawing authority from Section 28 of the Right to Information Act, 2005.